The fact that most outside insulation products need weather barriers is widely recognized: Outdoor applications require protection from UV rays, moisture intrusion, mechanical abuse, chemical resistance, etc. Without an appropriate, well-applied protective system, the insulation will not perform as expected over the projected lifespan of the insulation system. Many indoor applications also require some type of protection from moisture, chemicals and mechanical abuse. Performance of the core insulation, as well as the correct selection and application of the weather barrier, is key to the success of the system. Traditionally, metal or plastic (i.e., PVC) jacketing or mastics and reinforcing mesh have been used for this purpose. Flexible cladding products that were recently introduced provide an alternative to these traditional methods. Flexible clad products are designed for both outdoor and indoor applications, providing resistance from weather, UV rays, as well as chemical environments and mechanical abuse expected during or after installation. Cladding will provide the insulation it is covering with a second layer of defense against moisture and chemical intrusion, thus reducing or eliminating the possibility of corrosion. Below is information about some of the flexible cladding products available, and their benefits, as well as answers to questions that must be asked to ensure a proper fit between the application and the product selected. Design considerations for weather barriers can be found in ASHRAE Handbook Fundamentals, Chapter 26, titled “Insulation for Mechanical Systems—Weather Protection/Vapor Retarders.” The definition of a weather barrier is given as: “A material or materials, which when installed on the outer surface of thermal insulation, protects the insulation from rain, snow, sleet, wind, solar radiation, atmospheric contamination and mechanical damage.” It must be able to take whatever the environment can throw at it. Thus, various environmental conditions may dictate which barrier to use. 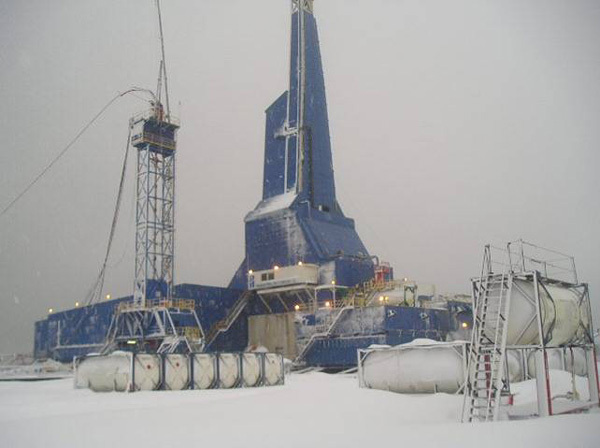 For example, industrial, petrochemical or offshore platforms each have unique considerations and require different weather barriers. Various service requirements must be considered when selecting a weather barrier: internal and external mechanical forces, chemical resistance, thermal degradation, temperature resistance, installation and application logistics, as well as maintenance requirements. There are a variety of flexible cladding/membrane products on the market. Many are multi-layer composites that provide better puncture resistance and ensure resistance to moisture over the life of the product. Some of the products have proven their reliability in other markets, such as roofing membrane, where the environmental conditions are similar to those exposed to an outdoor insulation system. These products are available in a variety of gauges/thickness, colors and, in some cases, various finishes or textures. The aluminum clad products will usually have a protective coating (such as PET) to shield it from chemical degradation. Some manufacturers sell the cladding as a stand-alone product, with or without pressure-sensitive adhesives (PSA), which allow the contractor to install the product at the job site. Other products are available with the cladding pre-applied by the insulation manufacturer or fabricator. 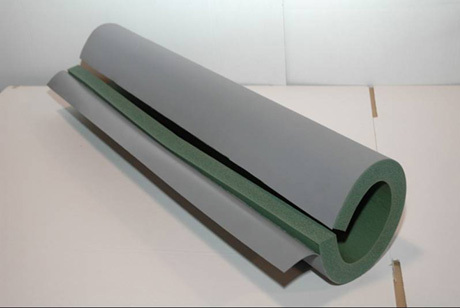 Some products are available only in sheets, while others offer complete, factory-applied systems for pipe insulation. Flexible clad products have been designed for standard commercial and industrial applications—such as outdoor ductwork and piping systems—with the same extreme design conditions experienced by an offshore platform in the North Sea. Flexible cladding products can offer a broad range of properties, including resistance to weather, UV rays, abuse, punctures, chemicals and mold, as well as excellent resistance to water vapor permeability. Clad products also have a wide range of temperature use and a low flame spread (rated as 25/50, or Class 1). They are self-adhering and self-healing, and have a long life expectancy. There are numerous advantages of choosing to use flexible cladding products over metal jacketing or mastics. Clad products are more flexible and resist mechanical abuse, such as denting from heavy foot traffic, ladder use, etc. The factory-applied systems ensure excellent adhesion of the weather barrier to the insulation, reducing concerns of environmental conditions during installation at the job site, further speeding up the installation and reducing labor time at the job site. Clad products are easier to install, with no special tools and fewer materials needed. They also leave minimal scrap materials and don?t require off-site fabrication. Flexible clad products are lighter in weight than metal jackets or mastics, making them easier to handle, and they place less load on the structure they are covering. They have fewer seems and are easier to repair if damaged, giving them an excellent appearance. Some factory-applied claddings on tubular products offer a lap seal system, thus reducing the need for secondary sealing tapes. These products are designed to adhere well to the insulation substrate as well as themselves. It is generally recommended to overlap the seams or use a seaming tape comprised of the same material as the clad product to ensure watertight seams. Overall, there is a greater reliability of the installed system when using cladding products, and the total cost of installation is lower. The emissivity of a weather barrier can affect the insulation thickness required for a particular application, whether it is for condensation control or personnel safety. In most cases, the emissivity of these flexible cladding products is greater than 0.80. In the case of condensation control, this may significantly decrease the amount of insulation required for an application as compared to a shiny metal surface. The emissivity of the weather barrier is a consideration that needs to be factored into the design of the system. Installation of self-adhering flexible cladding products, whether done at the job site or factory, is quite easy. 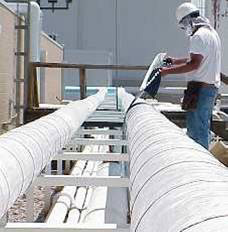 Start by measuring the circumference of the pipe or dimensions of the duct to be insulated. Cut the sheet to the required length, making sure to include overlap. Align the material, but do not peel off the liner before application. Apply the cladding to the insulation and peel back the liner, smoothing out the liner as it is removed. Ensure that there is overlap on all of the edges. Lastly, use sealing tape on edges and bends, and make sure all material is pressed down firmly to give good contact. When installing insulation with factory-applied flexible cladding, use the insulation manufacturer’s recommended instructions for installation. Generally, sealing tape made of the same material as the cladding is used for fastening seams and edges. 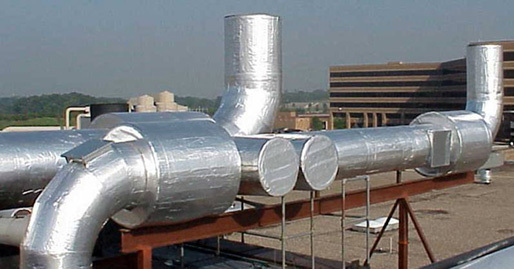 Required maintenance or checking the piping/duct system for corrosion or other issues is easily done when flexible products have been used as the weather barrier. Often, only a patch is required to fix the damaged or inspected area. When considering the use of flexible clad products, several considerations must be made. 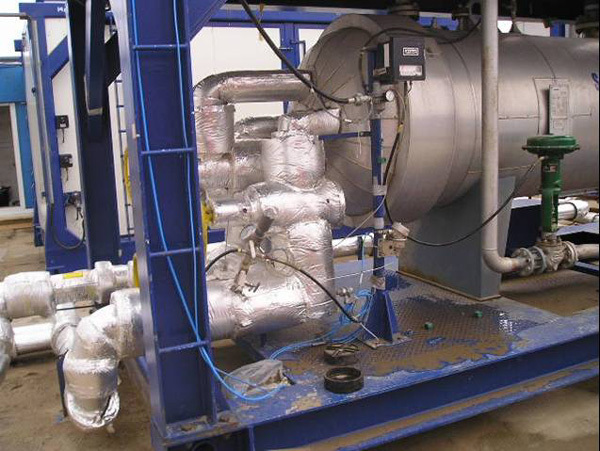 Is the flexible clad product suitable for the environmental conditions it will be subjected to? Are the adhesive and closure systems acceptable for the conditions they will be subjected to? In this case, issues such as hot and cold cycles, reflected heat, and moisture and chemical resistance must be taken into account. Are the insulation and the clad system compatible? 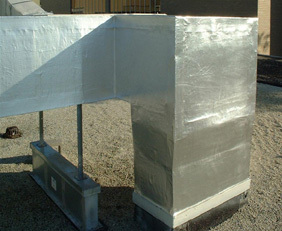 Flexible clad products offer unique properties to performance and installation as compared to traditional weather barrier systems. There are many applications where traditional systems will work fine or may be best suited, but as the flexible clad products continue to improve over time, they should be considered for any outdoor or indoor application where mechanical abuse is a concern. The variety of flexible cladding types is also growing, offering options for specific applications. With the growth of product options and proven field performance over time, their acceptance in the marketplace will increase as well.